The Water Agreement defines water uses as the amount of water supplied to Los Angeles land on the Bishop Cone less any return flow to the Los Angeles Aqueduct system. Uses include irrigation, stockwater, and recreation, as well as conveyance losses (i.e. water seepage from canals and ditches). Groundwater extraction is defined as the sum of all groundwater pumped by LADWP on the Bishop Cone plus the amount of artesian water that flowed out of uncapped wells on Los Angeles land on the Cone during the runoff year. LADWP collects the pumping and surface water information at mutually agreed upon measuring stations and provides that data to the county. 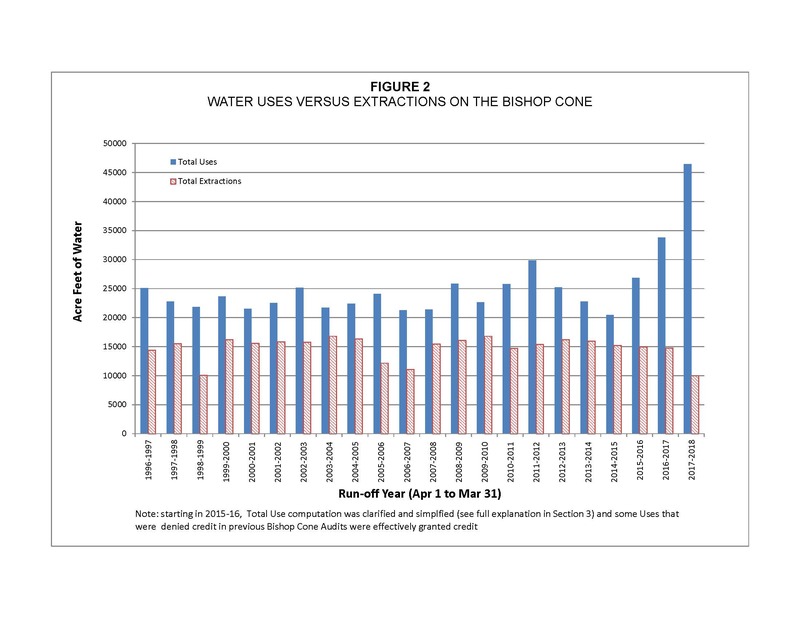 ICWD performs the audit and reports on the water uses and groundwater extractions on the Bishop Cone.